Queen Elizabeth’s court is shaken when the body of Her Majesty’s newest lady-in-waiting is found on the altar of the Chapel Royal. Nicholas Holt, younger brother of the Earl of Blackwell, has been summoned by Sir Robert Cecil, the Queen’s spymaster, to solve the crime. A bit of a rogue and always glad he didn’t inherit the title, Nick was blackmailed into being a spy by Cecil because brother Robert innocently corresponds with an exiled Catholic friend. Since the Court is now Protestant, Cecil threatens to arrest Robert for treason, unless Nick spies for him. Now Nick must bring his skills to finding a murderer. Not a hatred of Cecily, however. Nick is certain whoever killed the girl intends the death to besmirch Her Majesty and Elizabeth’s court. Which of the queen’s enemies would make so twisted a plan? At first, his investigations find little. Naïve Cecily was lured to her death with a love note written by an unknown admirer. A small topaz fell from the handle of the death-dealing stiletto. A handkerchief found at the scene indicates the killer had a cold. With his Irish Wolfhound, Hector, by his side, Nick scours the apothecary shops in search of someone recently buying a cold remedy. Hector is a great aid in his investigations. The dog’s size alone is enough to unnerve the bravest. With his own brand of forensics, Nick learns the killer is left-handed. That eliminates all but three of the men at court. Before Nick’s investigations can go further, there’s another murder. Cecily’s closest friend, Mary is also killed, her body arranged in the same way, though the manner of death is different. This makes Nick think there might be two killers, or if only one, he’s changed his method of killing. There are easily two culprits for Mary’s death—another woman’s unfaithful swain and a taciturn nobleman—but Nick isn’t entirely convinced of their guilt. Nick feels he’s missing something, some small clue that will give him the answer he needs. It would be easy to wait for another murder to happen and amass more information, but Nick doesn’t want another innocent youngster’s life lost because of his inattentiveness. Thus, he turns to those no one considers worthy of notice, the “invisible” people others prefer to pretend don’t exist, those actually running the households and making life easy for their so-called betters . . . the servants. It’s in the kitchens and below stairs that the answers to his questions will be truly answered, but not before the killer again strikes. In vivid passages, Suzanne Wolfe’s novel brings to the reader the light and dark of Elizabethan England, its squalor and splendor, filth and riches, intrigues and delights. Mixing historical characters as well as fictional ones into a web of deceit and murder, the author has created a worthy detective in Nick Holt, reluctant spy. As owner of The Black Sheep tavern, well-named for its patrons, Nick is in a position to see the best and the worst and as one of the queen’s spies, he’s met such characters on a professional level. The descriptions of Queen Elizabeth I, Sir Robert Cecil, and a young Will Shakespeare, among other actual personages, are skillfully woven into the story, giving the tale an authentic air. In spite of the lack of today’s forensic tools of investigation, Nick proves to be an investigator above par, with the aid of his physician friends Eli and Rivkah, refuges from Spain. The relationship between Nick and Rivkah, little more than hinted at on his side and more clearly revealed by Nick’s subconscious while he sleeps, is doomed because of politics and religion. She’s a Spanish Jew, he a secret Catholic, and this adds a note of poignancy and longing to Nick’s otherwise roguish life. 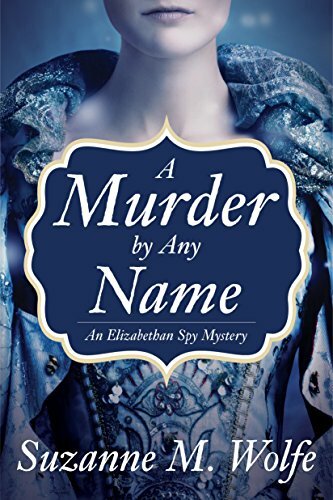 While more a desperate, frantic gallop through history than a light-hearted romp, A Murder by Any Name is a tense and colorful tale of mystery at Elizabeth the First’s court, where intrigue runs rife and occasionally murder seems the only way to achieve a goal.